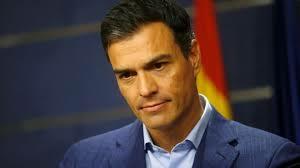 Spanish Prime Minister Pedro Sanchez said Thursday that Catalonia’s deposed independence leader Carles Puigdemont and other separatists “must be tried by the Spanish courts”. Puigdemont, 55, was detained in the north German region of Schleswig-Holstein in March after Spain issued a European Arrest Warrant, and a German court has decided to allow his extradition. “We do not comment on court decisions, we respect them… whether in Spain, Belgium, Germany or elsewhere,” he said. The court in Schleswig-Holstein gave the green light to Puigdemont’s extradition for misuse of public funds but not the more serious charge of rebellion, which carries up to 25 years in jail. German prosecutors must now decide whether to transfer him to Spain. If Puigdemont is extradited, the Supreme Court in charge of the case will not be able to try him for rebellion. He is one of 13 separatists accused of rebellion, four of whom are in self-imposed exile in various European countries following October’s banned independence referendum. The other nine are in custody in Spain awaiting trial. Puigdemont was detained while crossing into Germany from Denmark on his way to Belgium, where he had settled following the failed independence push.